This remote display panel supplied with the Progressive Industries EMS-HW50C alerts you to any errors, voltage for each leg as well as current draw for each leg. A bypass switch on the left allows you to easily use generators that don’t normally work with the EMS or to bypass the EMS for other reasons. When we bought our new RV it was for us a sizable expenditure. Such being the case we considered things we could do in order to protect it. A good polymer treatment for the paint was one thing. Another was a Progressive Industries 50 amp hard-wired electrical management system (EMS) in order to protect the electronics from, among other things, power surges, high and low voltages sometimes encountered at campgrounds. Progressive makes a number of EMS systems, some intended to hang on the power pedestal and some to be hard-wired into the RV. Another measure of protection we purchased was a 50 amp voltage regulator, a Hughes Autoformer. This device can boost campground voltage when it falls dangerously low allowing you to safely use equipment that might otherwise be damaged by the low voltage. They also make a 30 amp model. The Hughes Voltage Regulator and Surge Protector. This device boosts low incoming voltage as much as 10% for safer operation of appliances that might otherwise be damaged by low voltage. Let me back up for a minute and explain my understanding of some of the problems and solutions encountered by RVers when it comes to campground electricity. I think it fair to say that most people have probably heard of power surges or voltage spikes that can fry electronic devices and surge protectors designed to protect electronics from these power surges. Power spikes may most commonly be caused by thunderstorms (lightning strikes), but other causes exist, for example, faulty transformers at the electric company or power lines falling on one another. Repairing or replacing appliances, computers, etc. that have been ruined by a power surge can cost many times that of a a good EMS. The same holds true for low voltage issues. I have also learned that low voltage may damage more RVers equipment than power surges. The explanation goes something like this: as more and more campers put more and more of a load on the electrical system of a campground the voltage in the campground can drop. Think of it as more and more people in an apartment building turning on their water faucets at the same time–the water pressure will begin to drop when there is more demand than the pipes can supply and the water runs slowly. I have heard the plumbing metaphor used as an aid toward understanding electrical voltage. When the voltage drops things such as air-conditioner motors are more prone to overheating. Low voltage is particularly bad for appliances with motors. This brings me to voltage regulators. By means of a little electronics trickery a voltage regulator or booster such as the Hughes Autoformer we purchased can convert unused amperage into voltage and automatically boost the voltage supplied to your RV from dangerously low levels to safe levels. 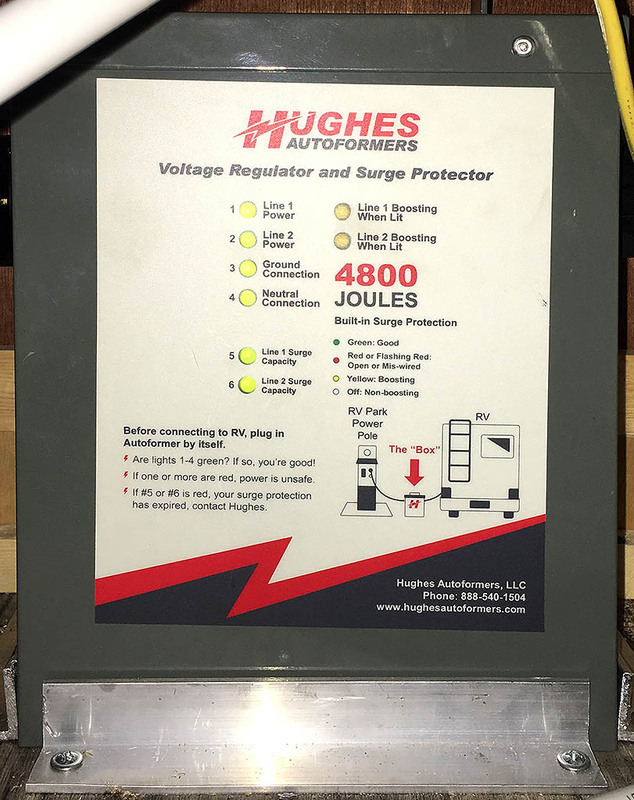 The Hughes unit also provides other measures of protection such as surge protection and bad ground or neutral wiring notification, but we bought ours primarily to protect against problems associated with low voltage situations. As I write this we are camped at a campground where the voltage from the pedestal is a bit on the high side. Although the voltage at the pedestal has generally been in the neighborhood of 124 to 128 volts (voltage tends to fluctuate) our EMS detected voltage over 132 and shut off power to the RV in order to protect it. This explains the title of this article, Too Much of a Good Thing – Electricity. Although the EMS was doing exactly what it is designed to do I was at a loss to explain why it thought the voltage was so high when I measured it myself at a lower level using my Klein Multimeter. After a couple visits to my campsite by the RV park’s electrician who’s voltage readings at the pedestal were close to mine, and a couple phone calls to Progressive Industries, the maker of our EMS, and Hughes, the maker of our autoformer (voltage regulator) I was able to track down and correct one problem so that we stopped experiencing most of the high voltage shut-offs the EMS was initiating. One problem was the EMS itself. It was misreading the voltage being supplied to it by the campground pedestal and misreading it on the high side so that it was interrupting power to the RV thinking it was over 132 volts when in fact it was not. 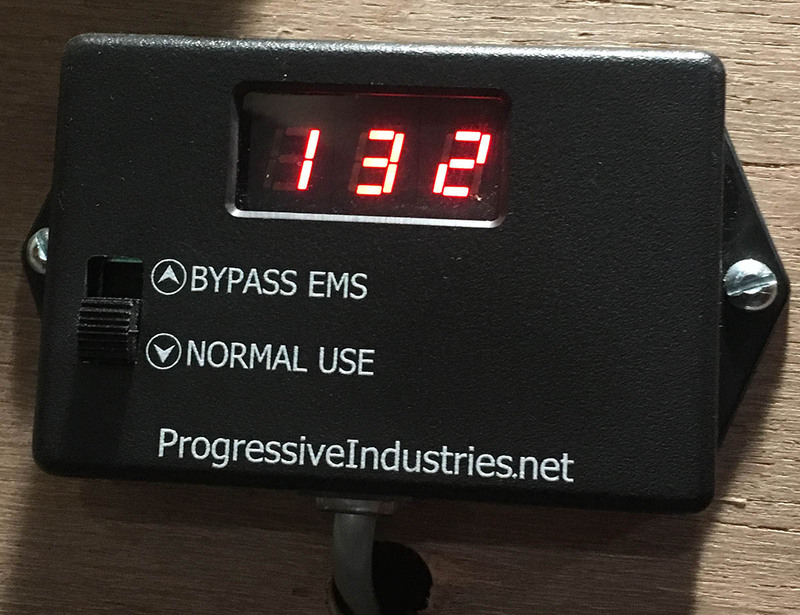 As it turns out there is an adjustment inside the EMS that allows you to calibrate the EMS’s reading of the incoming voltage to the actual incoming voltage from the power pedestal. In other words, in our case, incoming voltage of maybe 128 or so was mistakenly interpreted as being over 132 and bingo, the EMS would shut off power. 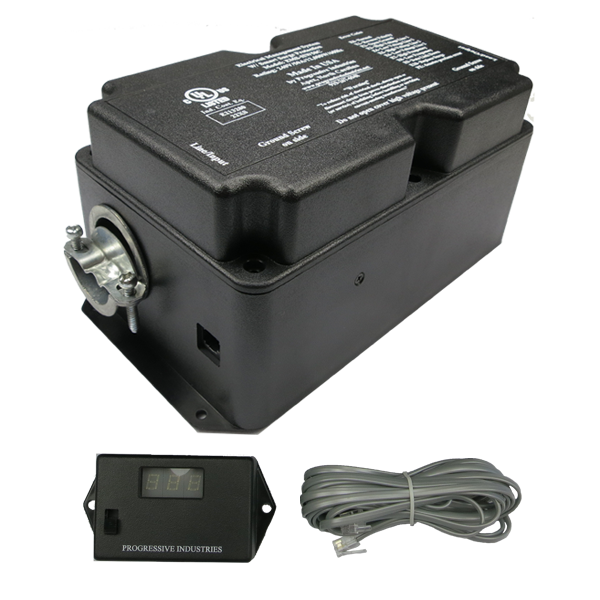 Cover of the Progressive Industries EMS-HW50C hard wired, 50 amp electrical management system. Our hard-wired, 50 amp Progressive EMS, model EMS-HW50C has a potentiometer (pot) for each of the 50 amp legs. (RVs with 50 amp service have two 50 amp circuits, or legs, for a total of 100 amps.) Think of a potentiometer as a volume control. Inside the EMS are two tiny little screws (see photo below) that can be turned left or right to adjust the EMS so that the voltage it thinks is being supplied matches the voltage actually being supplied. Turn the screw one way and it increases the number; turn it the other way to decrease–like a volume control. In our case the EMS was out of adjustment. Whether it was not adjusted properly at the factory or it went out of adjustment as we bounced down the road I’ll never know. 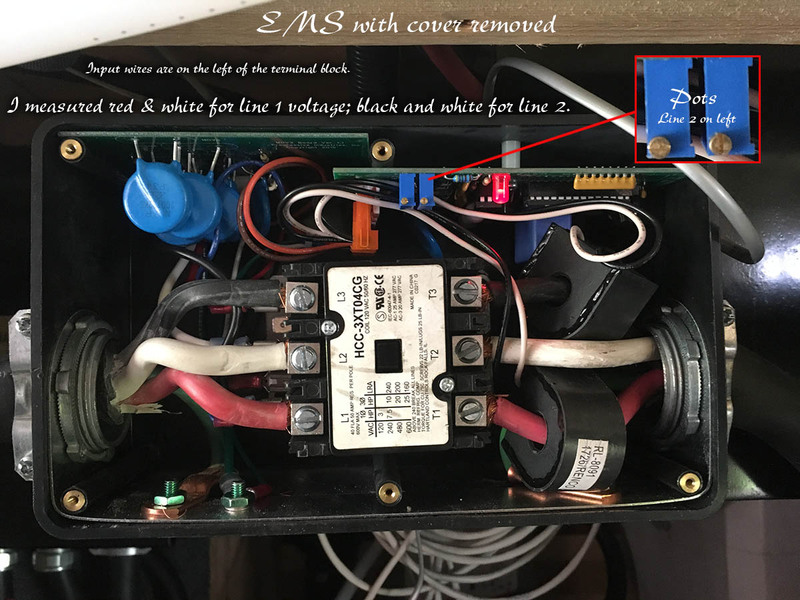 I went into the belly of the RV where the EMS is installed, removed the cover of the EMS and adjusted the pots so that the voltages displayed on the EMS’s Remote Panel inside the RV matched those I measured coming into the EMS. Still, I saw something puzzling: the voltage at the input to the EMS was higher than that which I measured at the power pedestal. “Not possible”, I thought. 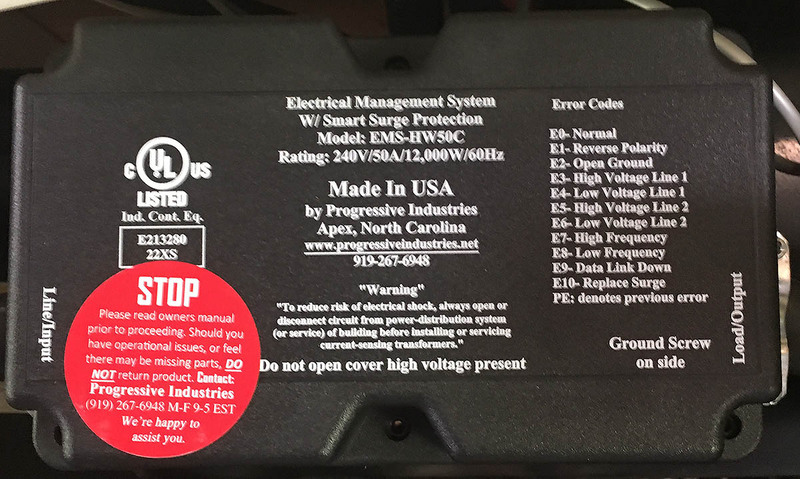 This shot shows the Progressive Industries EMS-HW50C hard-wired electrical management system with cover removed. I have labeled line one and line 2 inputs as well as the line 2 potentiometer for calibrating the EMS remote display panel to actual line voltage. Line 1 would be the other pot on the right, of course. I applied these labels from memory so DO NOT rely on my labels. At that juncture I suspected that the autoformer was malfunctioning, boosting the voltage when it shouldn’t, and I called Hughes. What you need to know here is that the electricity coming from the power pedestal goes first to the autoformer, then to the EMS before running into the RV’s internal wiring. As it turns out–I learned while speaking with someone at Hughes–the autoformer boosts the voltage by 2% when not in Boost Mode. (I don’t know why it does this, but I plan to inquire.) In Boost Mode it ups the voltage by 10%. What this means is that if the voltage at the pedestal rises to 130, the autoformer will boost it to over 132 volts and the EMS will disconnect the RV from the pedestal–and that’s what was happening. To recap what was going on: the voltage at the pedestal was a little high, the autoformer was applying a 2% boost to that voltage; the EMS was misreading that voltage by several volts thinking it was higher than it was and then disconnecting the RV from the pedestal reporting over-voltage conditions that for the most part didn’t exist. Excessive voltage from the power pedestal plus an unnecessary boost to that voltage applied by the autoformer, plus a miscalibrated EMS mistakenly reading the incoming voltage as higher than it was all combined to cause the EMS to repeatedly shut off power to the RV. There were two things I could do relatively easily to reduce the likelihood of over-voltage shut downs and the first action to take seemed obvious to me: calibrate the EMS via the pots to the actual incoming voltage. If that wasn’t sufficient I could remove the autoformer from the circuitry which would drop the voltage input to the EMS by a couple volts plus or minus. Since there’s only been one over-voltage disconnect initiated by the EMS since recalibration I’ve so far chosen to leave the autoformer in place. I guess with every additional device comes the potential for additional problems. That’s what I experienced here but unlike a fried computer or burned out air-conditoner there was no expense in correcting the problems. This blog takes an enormous amount of time and energy to build and maintain . If you have found something useful or entertaining please use this Amazon.com link (or those I provide within my articles) when you shop at Amazon. Doing so will cost you no more and in some cases I may receive a small commission. Your support in the form of using my Amazon.com link or making a PayPal Donation will be greatly appreciated. Thank you. If you would like to be notified by email when I make new posts to the blog look for the email text entry field and the FOLLOW RUSS button on the left, or with some mobile devices at the page bottom.